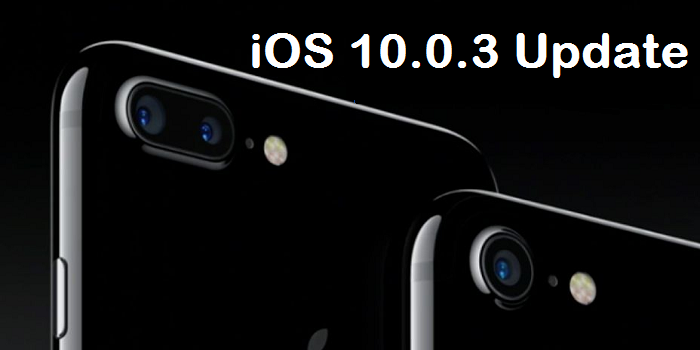 Go Download Apple's iOS 10.0.3 Update Right Now! If you have bought the latest iPhone lately, are you been faced with a sudden loss of mobile data connectivity on your iPhone 7 and iPhone 7 Plus? Apple has released iOS 10.0.3 update exclusively to fix this bug that’s exclusive to the Apple’s new flagship smartphones. The lightweight patch mostly aims to fix a bug that could cause some users to temporarily lose mobile data connectivity. Unlike other updates, this update is not available for other iOS devices. There have been numerous reports of cellular connectivity problems for iPhone 7 users, particularly those on Verizon. A series of discussions on the Apple discussion board show that users have seen their service drop from LTE to 3G, and then to no service at all. The fix appeared to be simple: just turn off Voice over LTE, and the problems seemed to go away. Apple was said to be working on a fix, and this seems to be it. The update is appearing now for iPhone 7 users. To install the update, open the Settings app and tap General > Software Update and you should see the option to do an over-the-air update. Just make sure you’re connected to Wi-Fi and either plugged in or have a good battery charge. The update can also be installed by connecting your iPhone 7 to your Mac and using the iTunes app. Since the 10.0.3 update addresses an issue specifically for the iPhone 7, the update is not seen by other iPhone models. For now, the iPhones in Apple’s current lineup are on different iOS versions. When Apple releases the iOS 10.1 update, which includes the Portrait mode camera feature, the iPhones will probably be back in iOS version alignment. Before running the iOS 10.0.3 update on your iPhone 7, be sure to back up your data.